Reading other travel blogs is an important part of my day. Earlier this year I saw an article about the top twentyfive US waterfalls. I was familiar with most but a few caught my eye. I have an online Google map where I mark places I’d like to visit so I dropped a few new stars on the map on my newly discovered waterfalls. 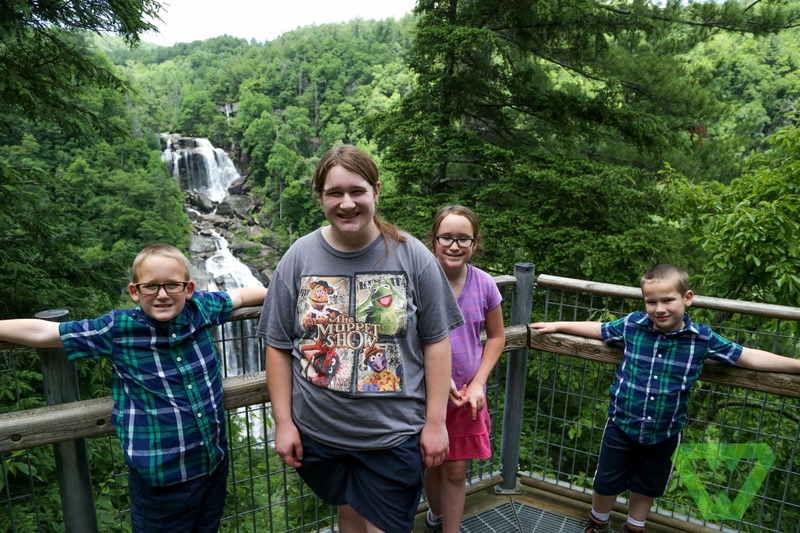 When planning our summer trip this year I noticed that our path came close to Whitewater Falls in North Carolina. Living in Utah we see a lot of waterfalls but few large ones with trees around them. After some discussion we decided to add Whitewater Falls to our itinerary. It was about an hour detour from our path between the Great Smoky Mt National Park and Atlanta, GA. It provided a great opportunity to get out, stretch our legs, and climb a few steps to release some energy. There is a medium-sized parking area with bathrooms and picnic areas. A paved walkway leads to a lookout. A short set of stairs leads down to an area better for seeing the falls. These falls are actually the Upper Falls which drop about 400 feet. There’s a second set of falls (Lower Falls) the next county over in South Carolina which drop another 300 feet.